In fact, there are a lot of shows under the director’s belt that show a distinct style of animation and direction, perhaps not unlike an auteur. 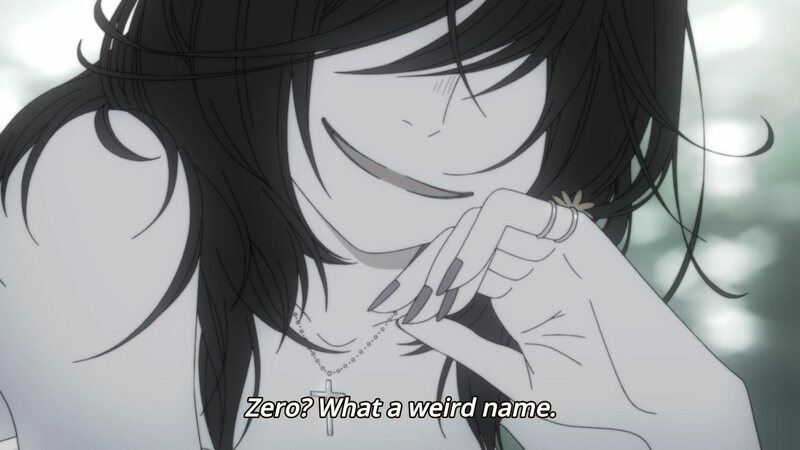 Indeed, there is a certain deliberateness to the director’s selection of themes to portray, which for many reasons makes it feel appropriate that Akiyuki Shinbo should pick up a series as nuanced as March comes in like a Lion. And in no small way is such a happenstance more meaningful than in the realm of animation. I will say this once, and probably several times more — but March comes in like a Lion was simply meant to be graced by such a skillful director in the animated format. It seems that whatever advantages there are to be gained through animation — be it in the visualization of mental concepts that simply cannot be fathomed through live-action cinematography alone — all of it was consolidated and brought to life through the artistic methods of Akiyuki Shinbo. And no less are the words “Some shows are simply meant to be in the animé format” any less true in the first episode of this remarkable show. The opening sequence is direct-to-the-point. The establishment of dichotomy is clear in the sound of wind and water — of the sea and of the air — polar opposites clashing in a depiction of light and shadow, with the winds blowing violently over a rippling tide. There is presence and absence — the silhouette of an unnamed man against a blue sky — the proverbial yin and yang that sets the thematic focus of this episode for the next twenty-odd minutes: contrast. Indeed, there is something jarring about watching a twenty-second introduction without any dialogue that establishes such a serious tone, only to be throttled into the twangy guitar riffs of Bump of Chicken singing the opening song “Answer”. But it’s in listening to the upbeat song and its visuals that we realize this is a story about hope. As early as the first few minutes of this show, Akiyuki Shinbo makes it clear that this is going to be a journey of contrasts. He doesn’t hold back the fact that this is a serious theme that he’s sticking his feet into — depression is a messy topic that is difficult to talk about in any public form of discourse — but it’s something that he’s nevertheless hopeful about. In other words, there’s cause to be hopeful in the sort of story that this unnamed man has to share with us. 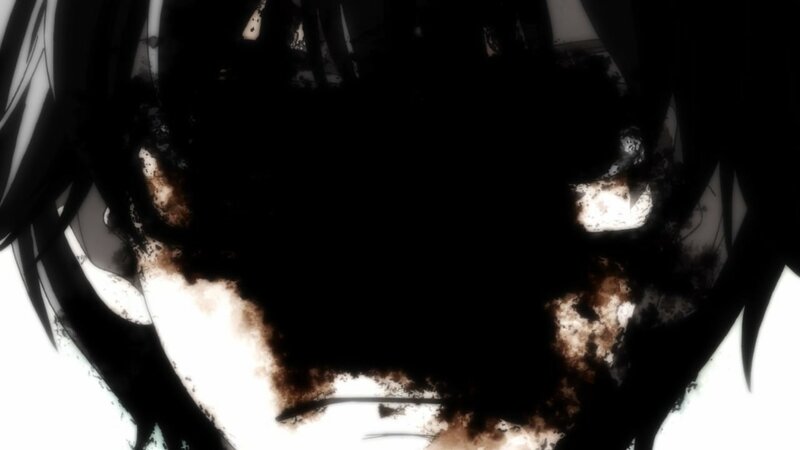 And that unnamed man is “Rei”, meaning “zero”, an irony that is ushered in by an unknown woman, who leaves our voiceless protagonist to disappear amidst a monochromatic inkblot within his own dreams. It’s a surreal sort of presentation that suddenly cuts out into the real world: a colorfully bright June morning in Tokyo, just at the tail end of the summer solstice. 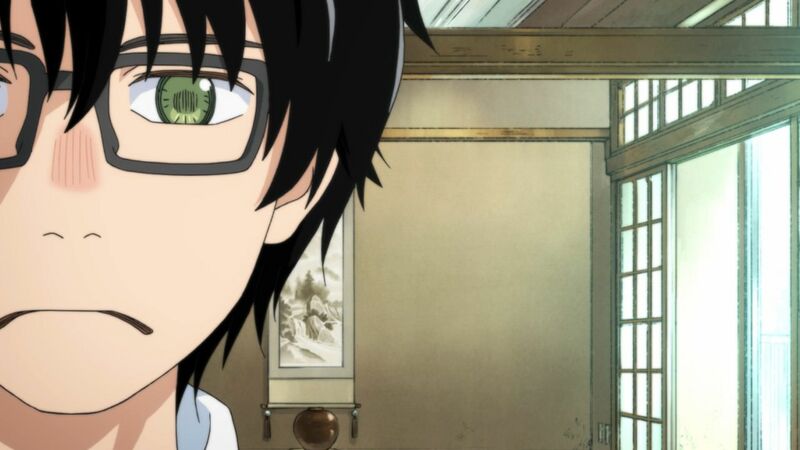 The water glistens under the glazed-over eyes of a sleepy Rei, and for the first time we take a good look at the main character of March comes in like a Lion. We take a look at his room — mostly empty — whose size is exaggerated by the camera’s perspective. 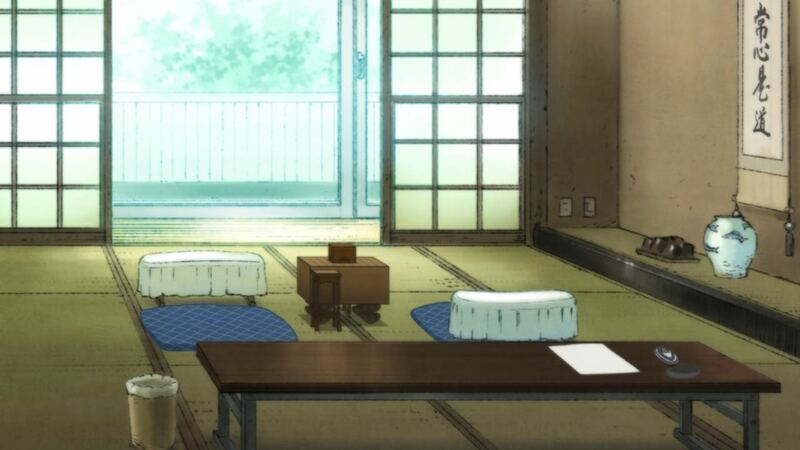 His room is decidedly empty — devoid of any personal affects besides a Shogi board — even lacking something as basic as a bed, supposedly implying Rei’s own lack of self-care. He doesn’t mind lying on the ground, which just so happens to be shared by his calendar and books and empty cups of instant noodles; his clothes blanket the floor as if it were also a closet. 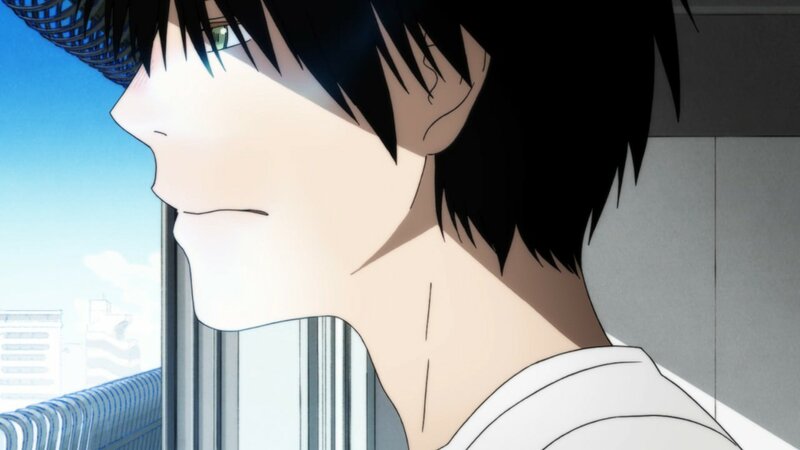 Without much in the way of dialogue, our understanding of who Rei is as an individual is portrayed in these subtle moments of character, and the emotional head space he occupies is projected even further through the camera’s exaggeration of perspective. This is one of several instances in this show where I believe that the animated format serves to heighten visual cues that would otherwise not be possible in the live-action format. For one, such exaggerations of perspective would be difficult to pull off without rearranging the physical space of the room, itself; and even then, it would simply result in a dissociation between the visualized object and the space it supposedly occupies (i.e. it’s jarring to realize that an object no longer occupies the space you expected it to). In animation, this sort of problem is seemingly obviated as compositional cues don’t necessarily have to revolve around a physical “set”. Depending on the intention, it serves more a purpose of effect than an actual omission of realism, hence the beauty of animation for artistic expression. 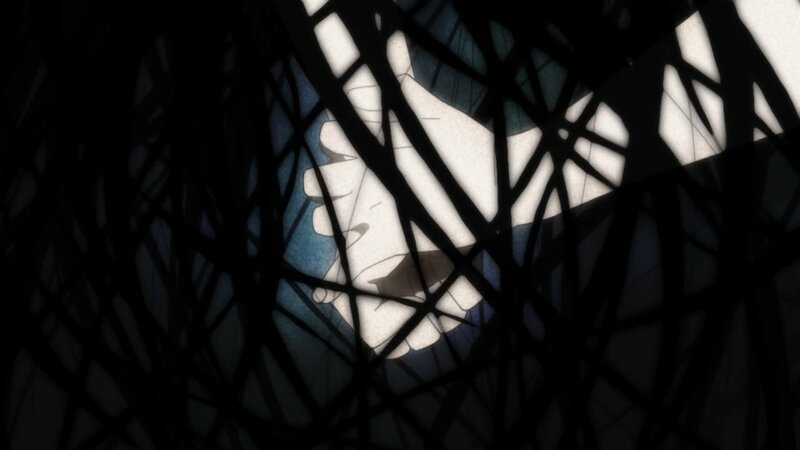 And in the case of this scene, the visual inconsistency introduced by this perspective serves to highlight the sort of emotional head space that Rei inhabits. 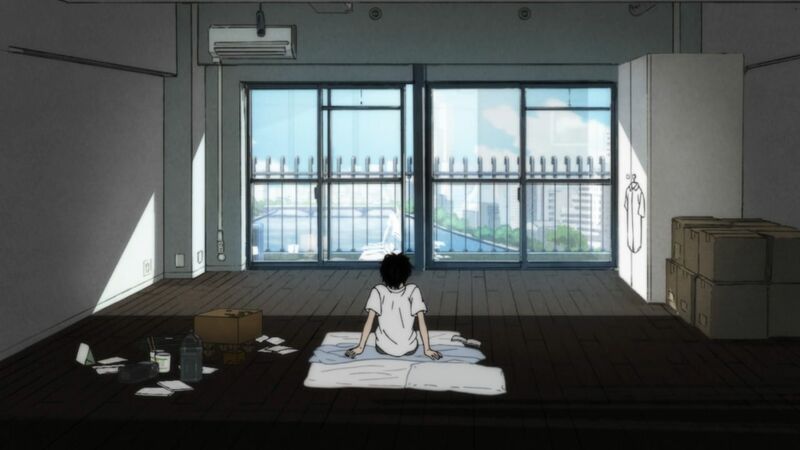 We understand, more or less, the sort of emptiness that he is experiencing — through the vast emptiness of his room — even though he has yet to say anything since the start of the show. 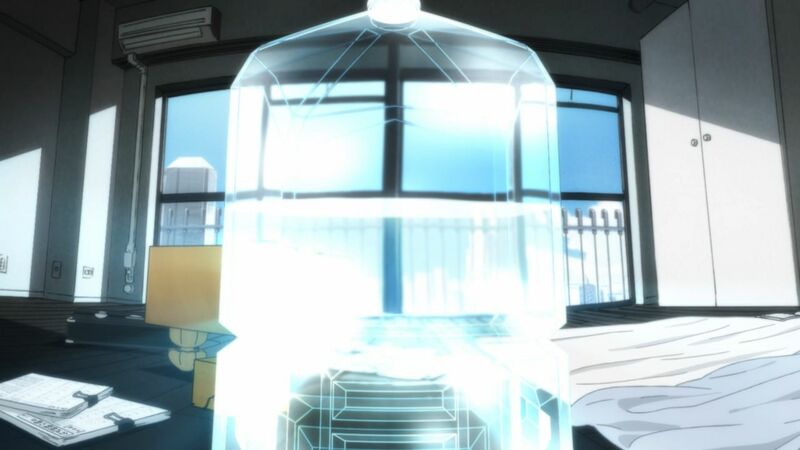 And yet upon leaving his room, we are left with a cramped, fish-eye shot of his quarters as seen through a water bottle — perhaps representing clarity — which seemingly tells us that what we saw previously was only a distortion of Rei’s own making: that the perceived emptiness of his room is only something in his mind. Afterwards, we follow Rei as he makes his way through metropolitan Tokyo. 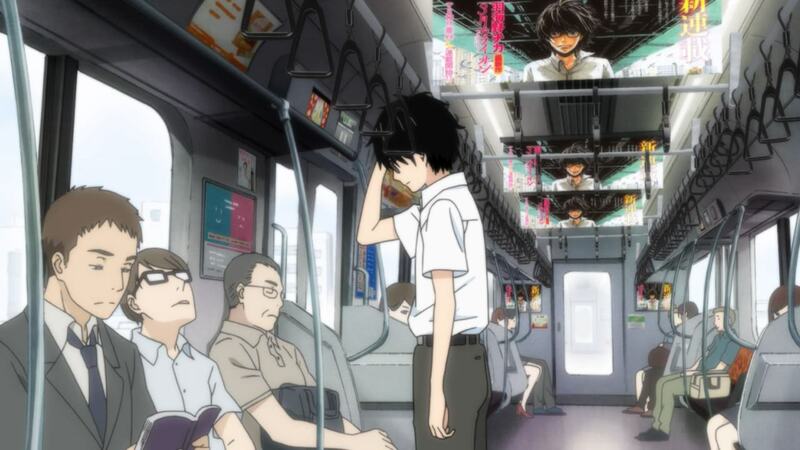 Even more characterization is seen with Shinbo’s choice of visual cues, ranging from subtle cues that obscures Rei’s face despite being in the center of the composition, to more direct cues like train lights heading towards Rei. Even more, we begin to understand Rei’s emotional head space: he lives in a world where he feels alienated and insignificant. His face is even placed up on an advertisement space on the train as a sort of meta joke — as if to say that his life was like a drama. And in some respects, I understand that sort of sentiment. When my loved one died of cancer, I sometimes felt like I was a character in a mad play that didn’t make any sense — like I was playing to the whims of a faceless audience that couldn’t possibly understand what I was going through for the sake of their enjoyment. 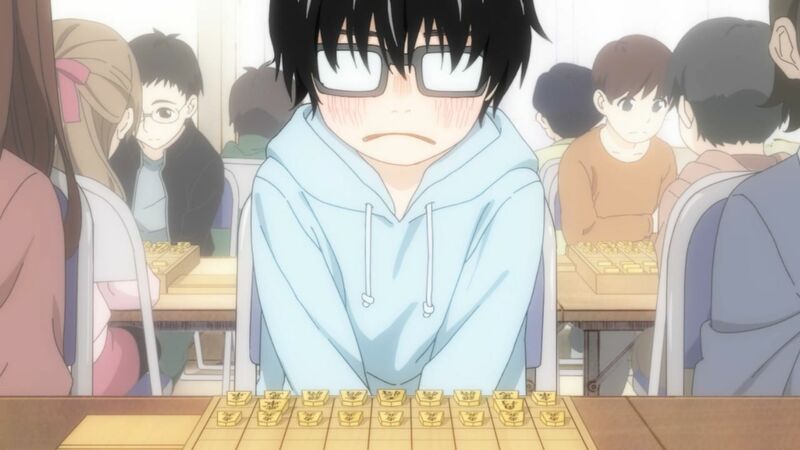 All the way up to his arrival at the Shogi hall, Rei’s individuality is shared to us through the camera’s use of space, and we are even invited to share in his own visual space as he inspects the contents of the match room — devoid of any players due to his punctuality — before he cozies himself up in his allotted seat. 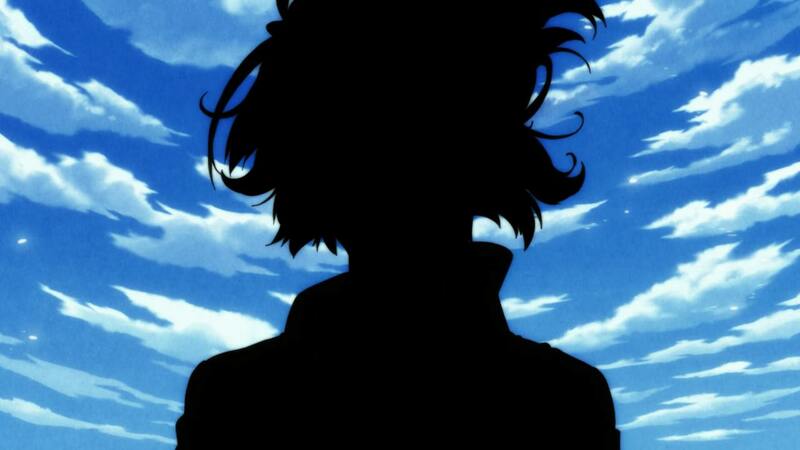 It’s this sort of character introduction that is seemingly rare in animé these days. For many productions, it feels like there’s a need to throw a character’s intentions front and center in order to sell their credibility to their will-be audience. But for better or for worse, these is a clear restraint in Akiyuki Shinbo’s decision to allow Rei to simply flow through the panels, even to the point of having a third party say out his name at the beginning of the episode. Indeed, he doesn’t even speak a single word until nine minutes into the production, and even then only says his full name until the very end of the first segment. And the same restraint is shown throughout the subsequent sequence wherein Rei engages in small talk with his foster father. 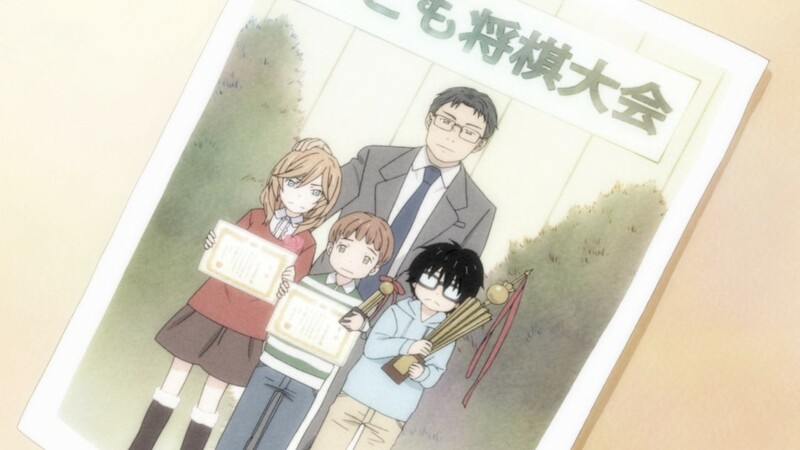 Although it was pretty much a one-way exchange, his father’s words conjure up memories of the past: a young Rei at a children’s Shogi tournament; a dissatisfied-looking Rei holding a trophy with two other similarly dissatisfied children. But even after the old man stops talking, the dialogue seemingly continues in Rei’s mind with him conjuring up even more scenes from the past. 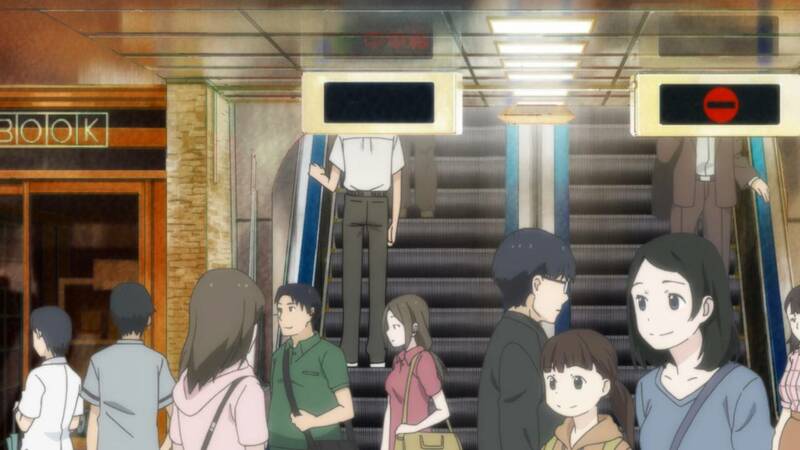 The passage of time is depicted through the clicking of shogi pieces, up until a final memory of a family parting ways is rudely interrupted by the passive resignation of Rei’s father: “There’s nothing”. It’s as if all of Rei’s memories were reduced to a single, inconsequential happenstance; everything was simply for naught. 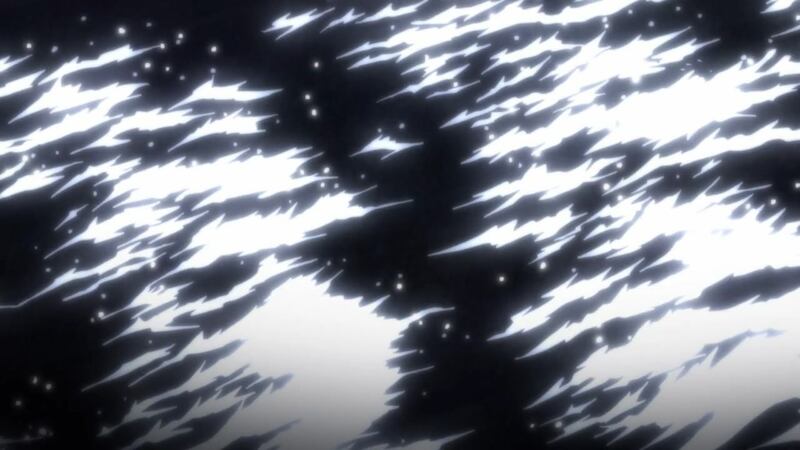 Of course, this sort of presentation is difficult to understand because of the non-linear presentation opted for by Shinbo (we learn much later on what this match means to Rei, and why he was feeling as melancholic as was throughout the first half of this episode). But any good story is structured around good storytelling, and the decision to present the story in this way has much to do with the creation of contrast, as previously mentioned. The first half of this episode is mostly melancholic — the head space of a depressed individual heading towards the seemingly inescapable task of defeating his own father in a Shogi match — but the latter half of the episode is dotted with the complete opposite: joy. The Kawamoto household is full of it. 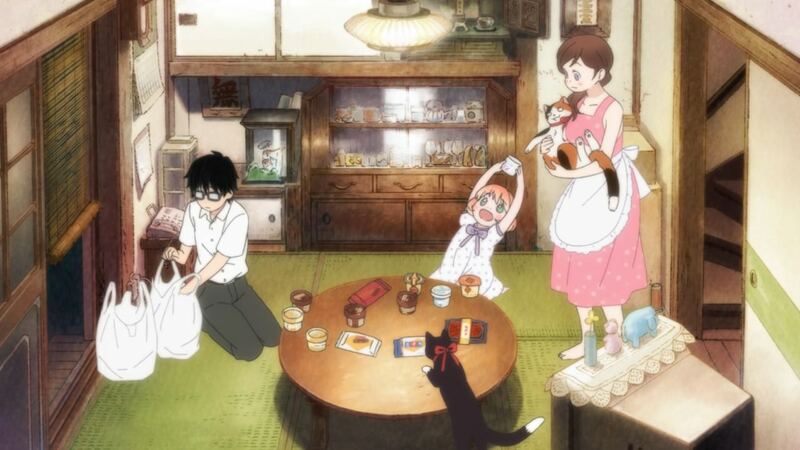 Compared to Rei’s apartment at the start of this episode, the Kawamoto’s house is depicted as cramped, colorful, full of life, and animated. There is a warmth that permeates its walls that seemingly emanates from its doors, like a beacon of light in the darkness of night. 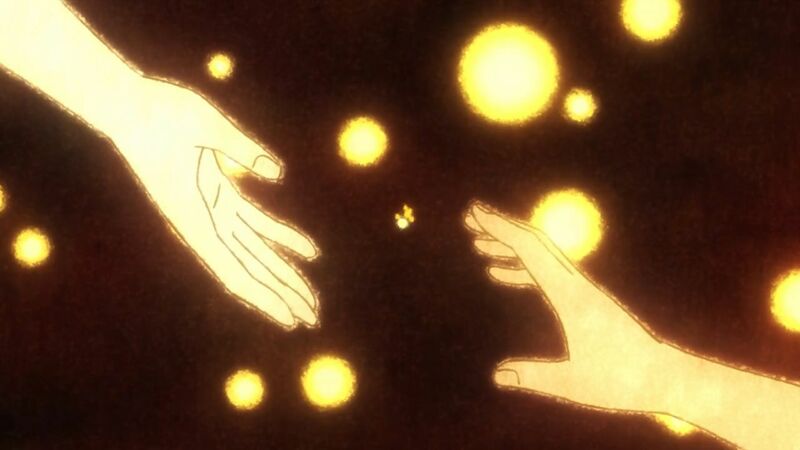 And Rei’s transition into this bubbly world is nothing short of nuanced. 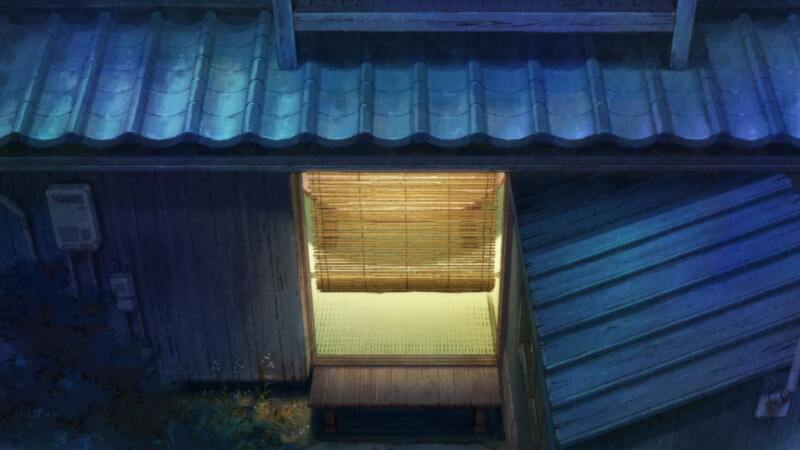 Indeed, he was somewhat reluctant to visit the Kawamoto’s in the first place, and was even seemingly swept into things because it was already far too awkward for him to have backed out. This is a sentiment that speaks much about the sort of person Rei is: burdened by a troubled family history, yet private as a person to the extent that he does not wish to impose his own troubles onto others. But even when he is trying to appear “okay” in front of the people who are trying to make him feel welcomed, his own troubles come to haunt him when a seemingly innocuous news report about a homicide weighs down upon the depressed Rei. He sees himself as the oppressor — the color robbed from his face and turned to grey — and he distorts his own perception of his match with his father as if he were bludgeoning him to death. He passes judgement over himself for being a terrible son — for being no better than a killer — and thus Rei succumbs to his depression despite being surrounded by the joy and warmth of the Kawamoto home. 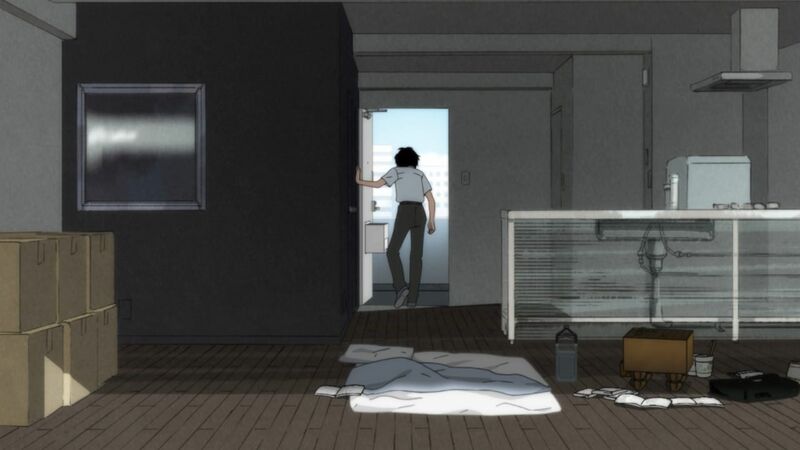 It’s this nuanced depiction of Rei’s emotions that shows us a painful reality of depression and mental illness: that it occurs alongside our own lived experiences. There is no on or off switch (you are not depressed one moment, and then happy the next), rather, it occurs as if it was a part of you, seemingly triggered by random events that would otherwise mean nothing to others. 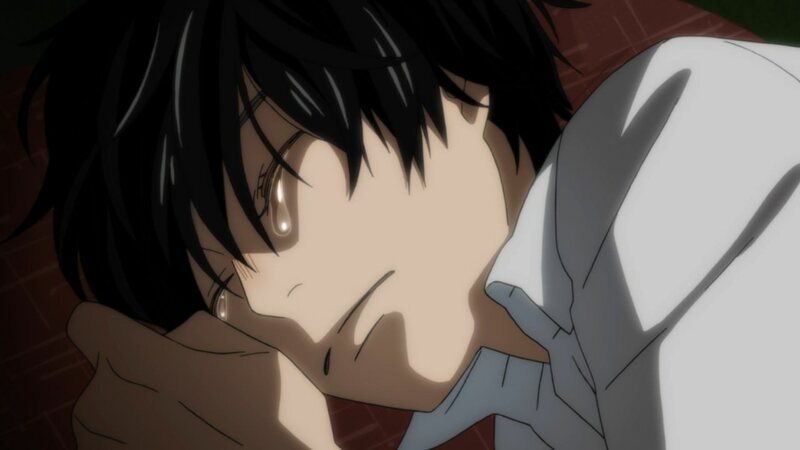 But to Rei, these emotions are real no matter how much he tries to hide it, as even Hina gets a glimpse of his pain when in his most vulnerable moments. 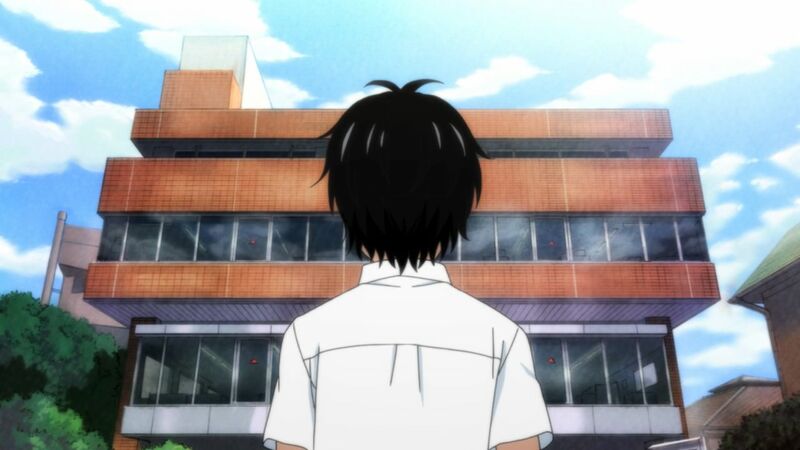 But despite his wretched self-introduction, Rei’s introduction in this first episode is quite possibly the most honest depiction of a troubled youth I’ve ever seen in a modern anime. It takes quite a lot to endear oneself to a person whose struggle seems so alien, and yet feels so relatable at the same time. His reactions feel genuinely human, and yet his world does not grind to a halt at each moment of emotional agony. 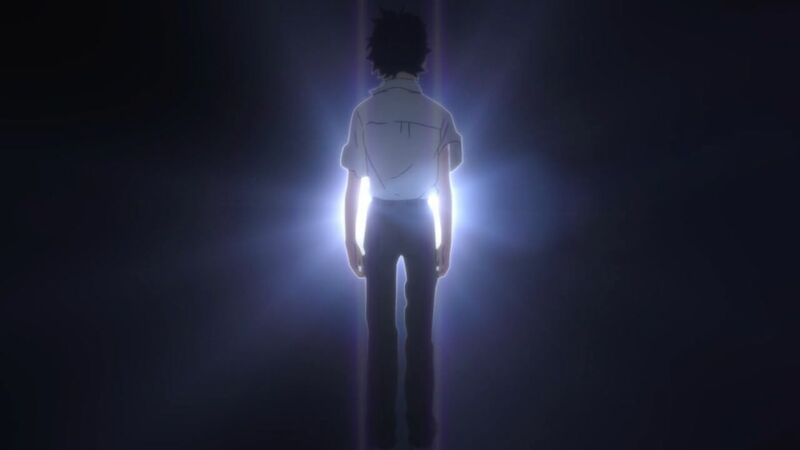 There is grace and intention in the sort of story that March comes in like a Lion presents us, which in no small way was greatly amplified by the directive finesse of Akiyuki Shinbo. In this particular show — like many of his other works — contrastive elements are exploited in order to depict the dichotomy of a lived experience full of sorrow: light and dark; wind and water; presence and absence. And yet despite the struggles of its youth, Rei shows us that not all experiences are as clear cut as simply being happy or sad. 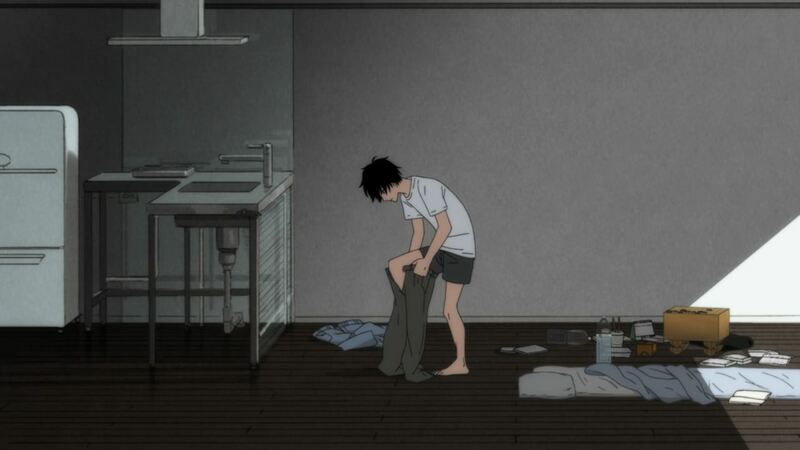 For this first episode of March comes in like a Lion, I decided to focus on the use of contrast, but there are many more elements in this episode alone that I would have liked to have talked about. I leave it for all of you to discuss it in the comments below. What about this episode did you like the most? What struck you as relatable? 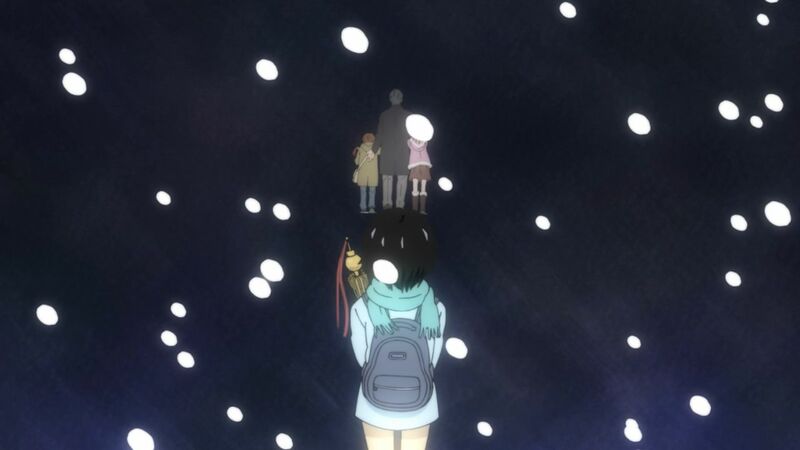 Do you agree with Akiyuki Shinbo’s depiction of sorrow as seen in Rei? Do let me know in the comments below. I’d love to hear your thoughts on this show. As for future installments in this series, I will follow a similar format of in-depth analysis and insight sharing. I hope that despite how long these entries will (obviously) be, that it sparks renewed interest in perhaps one of the greatest shows I’ve seen in recent years. This is such a great post. I love this anime and one thing I always loved about it was how it manages to really convey emotions and ideas using everything it has with visuals, sounds, characterisation, etc. I really enjoyed reading this post and being reminded of just how solid this first episode is as an introduction to the ideas in this show. Thanks for sharing. It’s interesting watching it all over again, because I honestly didn’t notice how sparse the dialogue was at the beginning. I guess the flow of the episode just felt so natural and worked so effortlessly to show us who Rei is as a person. Quietly evocative while also on-point. Thanks for this. Thanks Dave. 🙂 I hope I can keep up the pace with the entries.